According to Tracy Baker, EMCC Networking Technologies Institute (NTI) Faculty, Arizona currently has close to 8,000 unfilled cybersecurity positions. The U.S. has more than 300,000 unfilled positions. And across the board, cybersecurity jobs are only about 70 percent filled. Estrella Mountain Community College (EMCC) is looking to change that. 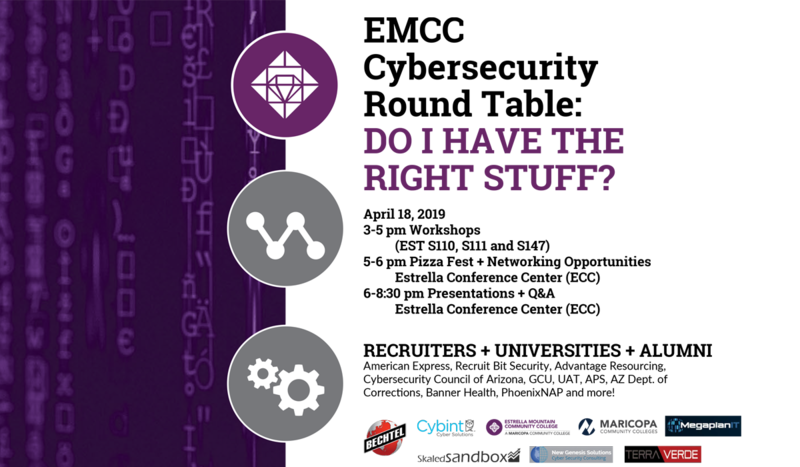 The college is hosting Cybersecurity Round table: Do I Have the Right Stuff? from 3 to 8:30 p.m. April 18 at 3000 N. Dysart Road. In addition to learning about the skill sets needed to succeed in the cybersecurity field, attendees will also have the opportunity to meet with industry and university recruiters. “Several EMCC students landed internships and jobs because of last year’s round table,” said Baker, who is one of the event’s organizers. Baker, who teaches Red Hat Linux in the Red Hat Academy, said the event is open to anyone interested in the cybersecurity field — students, faculty, staff, and members of the community. A number of EMCC alumni currently working in the field have also been invited. “These alumni have agreed to meet with attendees one on one and share their experience on the job,” Baker said. Round table presenters include Bryan Dickens, a retired FBI agent who represents Cybint, a cybersecurity education company; Ryan Chapman, a security operations center (SOC) analyst from Bechtel, a construction company; and Andy Jordan, a cybersecurity architect, who will explain what it’s like to start one’s own cybersecurity company. “They represent a wide-ranging array of perspectives when it comes to cybersecurity,” Baker said. Baker said cybersecurity has grown along with the spread of computing and networking technology. “It has also gotten more sophisticated as the ‘bad guys’ come up with new and different ways to compromise our systems,” he said. It is that rapid growth that has led to a dearth of filled cybersecurity positions. Baker said the field of cybersecurity comprises technical skills as well as soft skills and human networking, all of which will be exhibited in one form or another at the round table. Baker stressed that cybersecurity is important, because in the end, it’s all about people. He said cybersecurity also involves keeping people physically safe, citing professionals who make sure the electrical grid isn’t compromised, who make certain self-driving vehicles aren’t taken over by people with malicious intent, and who safeguard national security. “Now think about our personal vehicles, baby monitors, home security cameras, construction equipment, industrial controls in oil and gas refineries and elsewhere, banks, health care, etc. Almost every aspect of our lives is touched my cybersecurity, whether we think about it or not,” he said.